What’s on your New Year’s resolution for 2018? Perhaps a slimmer body with tighter abs? The good news is that you don’t need to get a tummy tuck or liposuction to achieve the body you want. At the Center for Dermatology and Laser Surgery, we have three fat reducing/body contouring technologies to help you get a better looking body without invasive surgery or recovery time. This technology freezes body fat, causing the cells to die and be absorbed by the body over several weeks. We do this without damaging the skin and muscles because fat freezes at a higher temperature than those tissues. Cooling panels lightly suction the skin and cool the tissue. This procedure kills about 20% of fat cells in the treatment area. You can expect an initial feeling of intense cooling followed by numbness without any pain. This fat cell disruption technology uses radiofrequency (RF) energy to eliminate fat around your abdomen or thighs. A high-frequency energy field delivers the RF to fat tissue in these targeted areas. The RF energy heats the fat layer to liquefy and kill fat cells without touching the skin. This procedure targets into the fat layer and not the outer skin or muscle layers. Most of our patients get one treatment a week for four weeks. Each session takes about 45 minutes to treat the abdominal area and 30 minutes to treat the thighs. We combine the above body contour procedures with BTL Cellutone to improve the appearance of cellulite-marred skin. This technology uses therapeutic vibrations to help eliminate restricted blood flow and waste accumulation, which forms cellulite. It enhances circulation and oxygen in the body to result in better looking skin. Cellutone also ensures that the fat cells that are frozen with CoolSculpting or melted with Vanquish ME are eliminated quickly and efficiently. Want to lose the inches without surgery? Call the Center for Dermatology and Laser Surgery at 503-297-3440 and ask about our non-invasive body contouring options. As we get older almost everyone develops the combination of looser skin and excess fat under their chin. And no matter how many chin lifts you do you can’t get your chin back to the profile you had when you were younger. Unless you give it the deep-freeze at the Center for Dermatology and Laser Surgery with our CoolMini™ procedure. CoolMini™ is a new procedure from the developers of CoolSculpting® and it is intended for much smaller areas, such as under the chin. If you follow the aesthetic industry at all, then you’ve probably heard about CoolSculpting®. CoolSculpting is a procedure that eliminates stubborn fat effectively and safely without surgery. It is the only procedure cleared by the FDA that utilizes controlled cooling to eliminate fat that is resistant to diet and exercise. The theory behind CoolSculpting originates from two Harvard scientists who observed that some children got dimples from eating popsicles. They assumed that the fat cells in the cheeks were dying from the cold temperatures, creating the leaner, dimpled cheeks. The same concept applies to CoolSculpting, which uses controlled cooling (Cryolipolysis) to target and kill fat cells. Fat cells freeze at higher temperatures than surrounding non-fat tissue. By precisely targeting the fat cells with the correct temperature, they are frozen and die. Over the subsequent few weeks, the dead fat cells are eliminated naturally by the body. During the CoolMini™ procedure, a proprietary coupling gel is applied to the area under your chin. Once the gel is applied, a vacuum is initiated through the applicator to suction the fat deposit in the area. The key for the CoolMini™ procedure is the applicator, which is optimized to capture and effectively treat smaller fat pockets. This is exactly what patients are dealing with under their chin. For 30 to 60 minutes, the applicator is held there to do the cooling. The result is a cold-induced inflammatory response that ultimately leads to the death of fat cells under the chin. After a few days or weeks, these dead fat cells are absorbed by the body as it heals, resulting in at least a 20% fat reduction in the treated area. These fat cells are permanently removed, similar to what happens with liposuction, but without the surgery. Why is CoolMini™ becoming an instant hit? The American Society for Dermatologic Surgery in a 2015 survey found that over two thirds of people said they were bothered by a double chin. So, you’re not alone in wanting a slimmer profile under your chin. 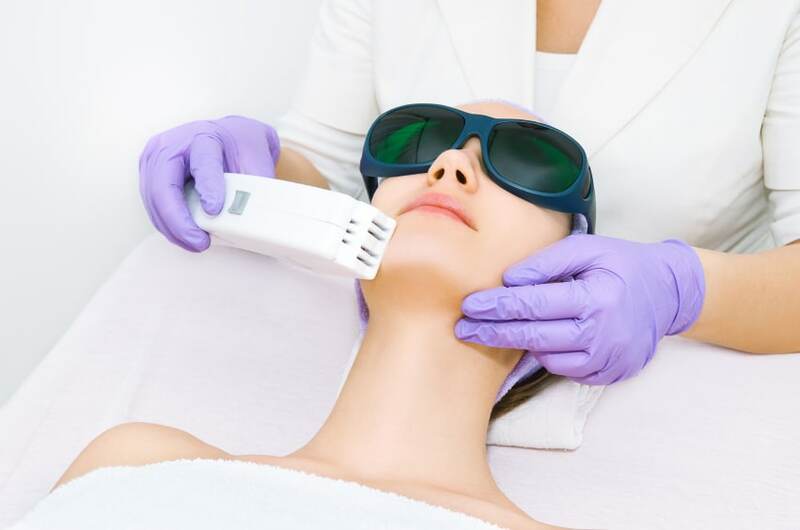 If you are interested in losing your chin fat call the cosmetic team providers at the Center for Dermatology and Laser Surgery at 503-297-3440 to discuss all of your options including Kybella® and Ultherapy. We look forward to hearing from you soon.